Why did the German SPD membership vote for the coalition? At 66 per cent on a 78 per cent turnout, over half (52 per cent) of the SPD’s membership of 464,000, voted for the grand coalition. So about 241,000 for, 122,000 against (and 101,000 abstentions). That is not close. It’s a bigger victory than the 60 per cent SPD leaders were privately predicting on Friday. Why the two-to-one vote for a coalition that has already seen the Social Democratic Party of Germany (SPD) slump in the polls? It’s not enthusiasm for the coalition. I suggest it’s for two reasons that I among others pointed to during the three week internal SPD campaign. 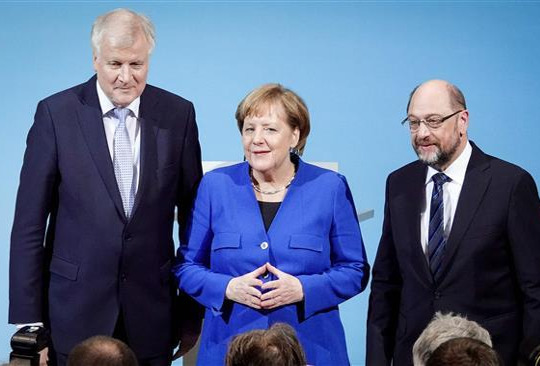 Left to right: Martin Schulz (former leader of Social Democratic Party – SPD), Angela Merkel (leader of Christian Democratic Union – CDU), Horst Seehofer (leader of the Christian Social Union in Bavaria – CSU). To reject the coalition would have opened the prospect of a fresh general election with the SPD going into the campaign polling just 16 per cent or less. The left did not have a good counter-argument to that, but instead relied largely on the assertion that there would not be another election and that Merkel would run a minority government. But that was no more than a bald assertion. Merkel made several interventions indicating that she would go to the polls, and not form a minority administration. That meant the left needed to provide a credible answer over fighting a March general election that would have had to go beyond simply the electoral fortunes of the SPD and toward some deeper strategy. Second, the rise of the AfD in the polls. The one poll (by Insa, and possibly questionable) putting the AfD half a point above the SPD sent shockwaves. But it’s not true that the only conclusion to draw from that was the left’s argument that going into grand coalition would lay the basis for further AfD advance. That is true and most people across the political spectrum recognise that as at least a strong possibility, as evidenced by the shifts in the polls even before the grand coalition takes office. But unless the left offers a plausible strategy and truly mass movement effort to break the AfD then its rise does not in itself lead to rejection of the coalition. It can equally, more so it seems among SPD members, lead to the conclusion: we have to hold to the coalition and try to make the best of that. We must avoid another election and aim under the coalition to rebuild the SPD’s support. We must hope over a span of the next four years to undermine the AfD. It is not at all clear that this government will last four years and there will be state elections in any case. But the temptation to hope for the best, according to the Micawber principle, is huge. That has happened before, including in German history. That’s a legitimate and limited parallel with 1930 and 1931: the sudden rise of the far right leading not to a shift to deal with them or the underlying causes, but a stampede to cling to the failed coalition and centrist politics that fed their growth. 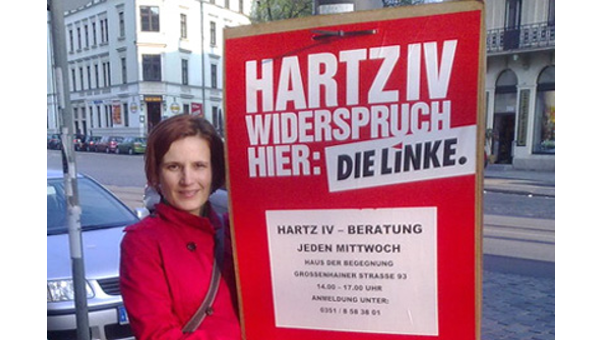 Lots of young socialists in the Jusos and some SPD MPs and functionaries are involved in anti-fascist campaigning. But that campaigning did not feature in this referendum in the SPD. It was instead dominated by the internal questions of the party and of ‘reclaiming’ it. If that is central, why not seek to reform the party over the longer period afforded by a coalition and avoiding a new election? The SPD referendum has raised profound questions of strategy for the left and of the construction of a mass movement against the AfD. In this context, an inward-looking campaign focused almost exclusively on ‘reclaiming the SPD’ did not rise to those challenges. There are lessons here for elsewhere in Europe. That includes in Britain, the one place where social discontent and the accumulated impact of social movements has found strong expression in the historic party of the centre left. Losing sight of the centrality of the social movements and of seriously dealing with the strategic dilemmas facing the left and working class movement underestimates both the scale of the challenges and the reasons for those advances that have been made. There was a whiff of hubris from some quarters, fuelled by superficial media coverage of the left’s campaign in the SPD, that you could formulaically transplant ‘Corbynism’ into the SPD or other parties. As if ‘Corbynism’ were the product of some organisational effort among one grouping of Labour activists or another. And as if what is central to it, rather than merely an aspect, is internal struggles in the Labour Party. The SPD result must give pause for thought over that, and over one-sided and schematic assessments that we have gone from a period of ‘pasokification’ of the social democratic parties to left-led reclaiming of them. Neither assessment is right. 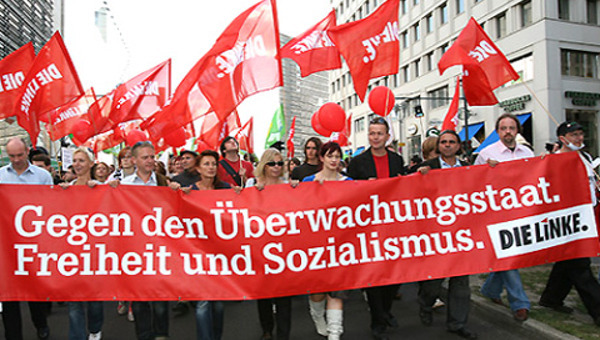 Social democracy is not simply withering away. But nor is it in some miraculous upswing via ‘international Corbynism’. There are contradictory pressures in a context of political polarisation and continuing crisis of the party system across most of Europe. Whatever the result of the Italian general election tonight it will definitely show that – it’s only a matter of precisely how and to what degree. So the big questions for the left and for the movements are even more pressing this afternoon. They will be particularly acute for SPD members and supporters, and not only the 122,000 who voted to reject the deal. But among them especially there is the sharp dilemma over what to do now. 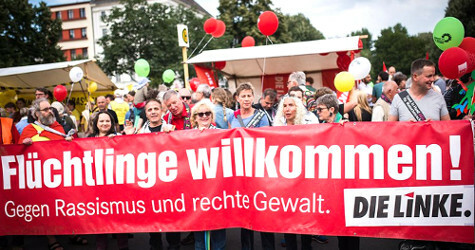 The forces of the anti-capitalist and radical left in Die Linke are in a position to help resolve those dilemmas. That cannot be just – join us, your leaders have betrayed. A few may immediately join Die Linke. But for tens or hundreds of thousands of SPD members and voters, they need to have answers that were not provided sufficiently in the internal party process over the last three weeks: over the strategic direction of the left and workers movement, and practical united efforts to break the AfD and the right. In other words – a politics that can pose very sharply an uncompromising anti-capitalist analysis and political struggle, and at the same time a broad unity of forces offering practical solutions in struggle for the mass of working people, specifically aimed at drawing in social democratic supporters. This article first published by Counterfire. Kevin Ovenden is a solidarity activist with the Palestinian struggle. He is author of Syriza: Inside the Labyrinth . 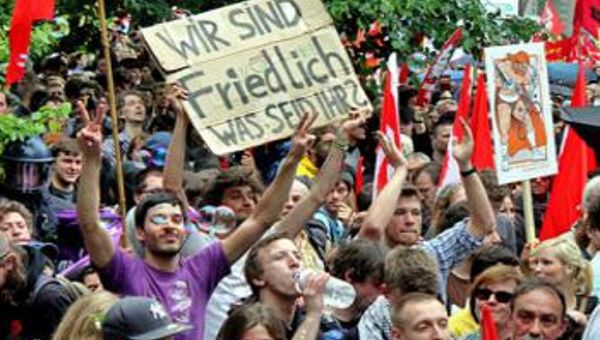 What’s Next After Blockupy Frankfurt?